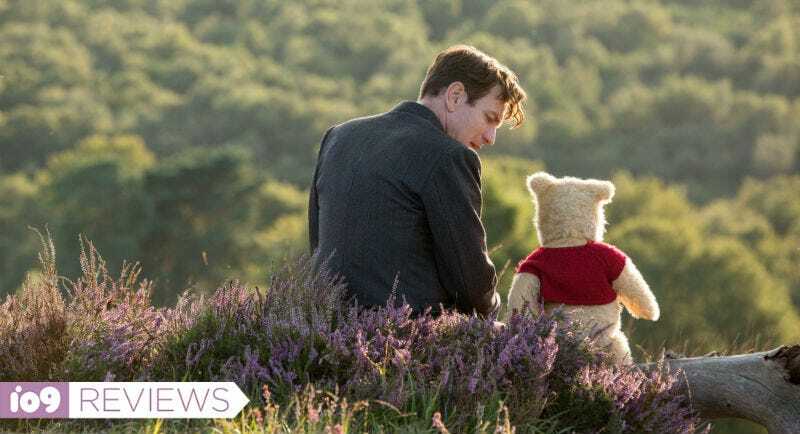 Christopher Robin (Ewan McGregor) and Winnie the Pooh (Jim Cummings) enjoy a moment in Christopher Robin. Remember the first time you tried alcohol? How it was gross and off-putting but eventually it got better? Later, maybe you grew to like it but you always knew something wasn’t right about it? That was the first (admittedly strange) thing I thought of after seeing Disney’s Christopher Robin, a movie that starts weird, gets better, and leaves you feeling just a little mixed up. Christopher Robin is directed by Marc Forster (Finding Neverland, World War Z) and stars Ewan McGregor as the title character. He’s a character that, if you know A. A. Milne’s stories of Winnie the Pooh and the Hundred Acre Wood, grew up playing with alongside Pooh, Piglet, Eeyore, Tigger, and all of their friends. However, this film picks up after that, on young Christopher’s last day with the gang as a young boy and, at least at the beginning, it’s a huge downer. Almost instantly, the film gives off a lackadaisical, dreary, muted feeling. Everything about it just seems off. Not bad, not wrong, just off. That feeling continues as the movie shifts into Christopher becoming a middle-aged man after some time in the war. He’s dealing with a job, a boss, and his family, including a wife (played by a criminally underutilized Hayley Atwell) and daughter (Bronte Carmichael) whom he regularly neglects. This section of the film is a bit peppier, but it feels like we came into it at an inopportune moment. Like we aren’t supposed to be watching it. Finally, just when he’s at his lowest point, a blast from the past in the form of Winnie the Pooh comes back into Christopher’s life, changing it forever. Winnie the Pooh in computer-generated “live action.” Who would have thought? Telling this specific story obviously means Forster and his team have to establish sad, adult Christopher Robin’s life quickly, but in doing so, they dig themselves quite the hole. Not only does the movie start with him leaving his innocence behind, it deals with some depressing grown-up issues. The film attempts to balance itself out by intercutting those early scenes with the Hundred Acre Wood, but it’s not like it’s a party there either. Mostly, Pooh and his friends brood about missing Christopher Robin. For a good portion of its runtime, there’s very little joy to connect with in Christopher Robin. Ever so slowly though, the film does shed its layers of pessimism, mostly by integrating Winnie the Pooh’s hijinks into the real world and adult Christopher Robin back into the Hundred Acre Wood. Then, eventually, the film pops its head out of the pool of despair and starts to find its legs a little. Things get more playful and whimsical about halfway through, so by the end, you’ll probably feel pretty good. However, even with the mood transitioning toward something resembling happiness, Christopher Robin never truly escapes its melancholy. The set pieces and boisterous emotions never quite reach memorable heights of excitement and wonder. It’s never as grand as, say, the easily comparable Paddington series. Instead, even when Christopher Robin is happy and exciting, it’s still kind of a bummer. Now, one may think simply seeing these iconic characters on screen would be uplifting on its own, but that’s not exactly the case. The visual effects that turn Pooh and friends into photo-real creations are remarkable and are always captivating to watch. You’ve truly never seen these characters like this before and there’s certainly a lot of nostalgia to mine there. On the other hand, there is something to say about Pooh and his friends being basically old, ratty, worn-down stuffed animals instead of the bigger, brighter characters we know from history. Their aesthetic, while beautiful, unquestionably adds to the sad quality of the film. The characters sound like Winnie the Pooh and look like Winnie the Pooh, but in this world, Pooh is much quieter, softer, and shabbier than we’re used to. He’s a sweet, lovable bear that feels like he’s wrought with tragedy. And, considering he’s now part of reality, maybe he is. Christopher Robin has the best intentions, but it never manages to thread the delicate tonal and emotional needles it wants to. It’s a film that has things to say but not the right ways to say them. It’s a bit too adult for kids and maybe a bit too kiddie for adults. And yet, it contains enough simple, powerful, Winnie the Pooh ideas that it’s bound to win over some viewers. I just wish it worked better on me.